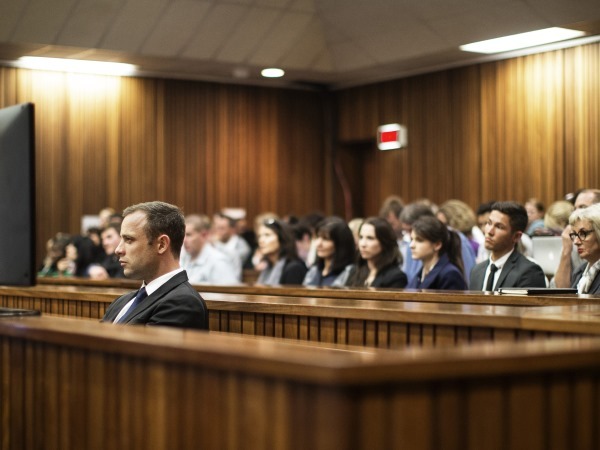 Paralympian Oscar Pistorius's murder trial was set to resume on Monday morning in a markedly thinned out public gallery in the High Court in Pretoria. Pistorius waited in the dock for proceedings to get underway, wearing a dark pin-striped suit, taking sips of water from a bottle. Friends and family of his girlfriend Reeva Steenkamp, whom he is accused of murdering on Valentine's Day morning in 2013, wore stickers with a picture of her face as they sat in a front row. ANC Women's League veterans had returned to their place on the "Steenkamp side" of a bench in the front row. Samantha Taylor, an ex-girlfriend of Pistorius who testified last week that he fired a gun from a car out of "irritation" after being stopped by police, was also in a front bench. Pistorius's uncle Arnold took up a seat behind him and his sister Aimee, who had provided emotional comfort last week, was also present, to the left of the court. Security guard Pieter Baba is expected to return to the witness stand.